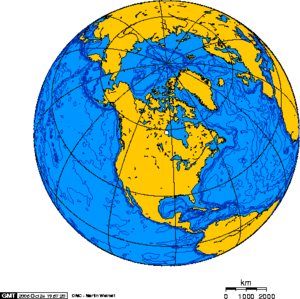 Orthographic projection centred over Churchill, Manitoba, Canada. Churchill, Manitoba is a small city, on the coast of Hudson's Bay, in the province of Manitoba, Canada. It lies at the mouth of the Churchill River, and is the rail-head of a rail-link to the North American rail grid. It is Canada's only seaport on the Arctic Ocean. It is North America's only Arctic seaport that is connected to the North American railroad grid. It is ice-bound from December to June. But it is ice-free in time for the annual wheat harvest. Shipping wheat is cheaper by sea, than by rail. It is cheaper to transport grain to Churchill by rail, and then transship it to bulk carriers to take to Europe than it is to transport it by rail to an East Coast port, and transfer it to a bulk carrier to the trip to Europe there..
With global warming there is speculation that it may become economic to ship other goods from Murmansk around the Southern tip of Greenland, to Churchill, and then by rail to markets in North America. This route is sometimes referred to as the "Arctic Bridge". In 1998 the aging and under-used port facilities, and tracks from Churchill to Winnipeg were bought by an American firm named Omnitrax, for just $10. Port facilities were opened in 1932. Grain shipments compose ninety percent of the cargo transiting the port. The port has four berths capable of handling deep-sea panamax vessels. The port is open from July through November. Efforts were made to construct port facilities at Port Nelson, Manitoba, approximately one hundred kilometres south, at the mouth of the Nelson River. Those efforts were curtailed during World War One, so resources could be put into the war effort. In 1925, when efforts were put into finishing a port, the work at Port Nelson was abandoned, and efforts were switched to Churchill. The Nelson River is siltier than the Churchill River, and has a larger flow, which meant that constant dredging would be necessary. Further, the river's mouth was broad, and shallow. This necessitated building a long causeway to an artificial island built in the middle of the river, where a channel could be dredged deep enough for sea-going vessels. ↑ 1.0 1.1 1.2 1.3 Canada's climate change boomtown, BBC, 2008-01-02. Retrieved on 2008-08-10. ↑ Bring General Cargo from European Ports To Churchill In July, Saskatoon Star-Phoenix, 1932-06-03, p. 5. Retrieved on 2010-10-. ↑ Transportation: Seaport at Churchill, Manitoba, Government of Manitoba. Retrieved on 2012-07-15. This page was last modified 03:17, 3 April 2017.